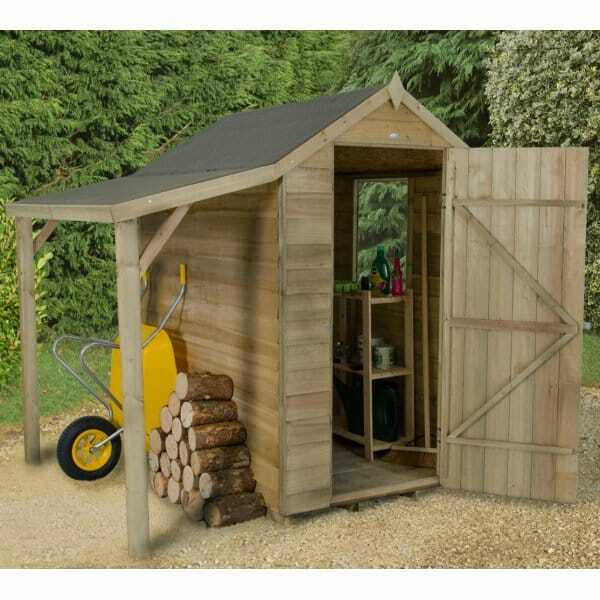 Forest Garden 4 x 6 Overlap Pressure Treated Apex Shed with Lean to: This wooden shed features a handy lean to on the side which can be used as extra storage for logs or perhaps a bicycle or garden toys. The shed is compact at 4 x 6 and would be suitable for smaller gardens where you may be limited on space. This shed would be ideal for small tools and equipment and is constructed from rough sawn overlap panels which are square ended to allow the rainwater to drain off. This shed features smooth planed barge boards and finial to give it an attractive finish and the timber is all FSC certified for you peace of mind. This shed has been factory pressure treated so that you will not need to worry about applying any annual treatment to the shed and it comes with a 15 year guarantee for assurance against rot. This shed is delivered in handy sections which are easy to put together making this a simple self-assembly proposition. This shed with lean to has a single door and 1 single window with unbreakable polycarbonate glazing that will not go yellow or brittle over time.